A vein of gold runs through the history of South Africa - and nowhere is that more evident than Witwatersrand, the richest gold reef in the world. Read Wilbur’s research below to discover its influence on his first novel, When the Lion Feeds. Friend of mine brought it down from Kruger's Republic on the other side of the mountains. He says it's gold bearing. They've made a big strike at a place called Witwatersrand outside Pretoria. My friend says the Boers are selling mining licences to them as they want to dig for the stuff. In the second part of When the Lion Feeds Sean Courtney and Duff Charleywood decide to go to the Witwatersrand and try their luck at finding gold. The Witwatersrand is a thirty-five mile-long, six mile-wide, north-facing ridge that rises 650 feet above the South African Highveld in what was the Boer Republic of the Transvaal. It forms the watershed between the Limpopo river to the north and the Orange river to the south. Several rivers flow over the north facing scarp as waterfalls, giving the ridge its name, Witwatersrand, meaning 'Ridge of White Waters'. The Witwatersrand, also known as the 'Rand', is the richest gold reef in the world and gives its name to the South African currency. There had long been rumours of gold in the Transvaal. In 1873 some small deposits were discovered just to the west of the Drakensberg mountains in an area that became known as MacMac because of the huge number of Scottish diggers who came prospecting. More gold was found three miles away in Pilgrim's Creek, enough to stimulate the creation of a small township that took the name Pilgrim's Rest. Mining continued here in a small way, for almost 100 years on and off, and the original mining village has been restored as a national museum and tourist attraction. During the Boer War Pilgrim's Rest operated an emergency mint producing rare Veld Ponds. 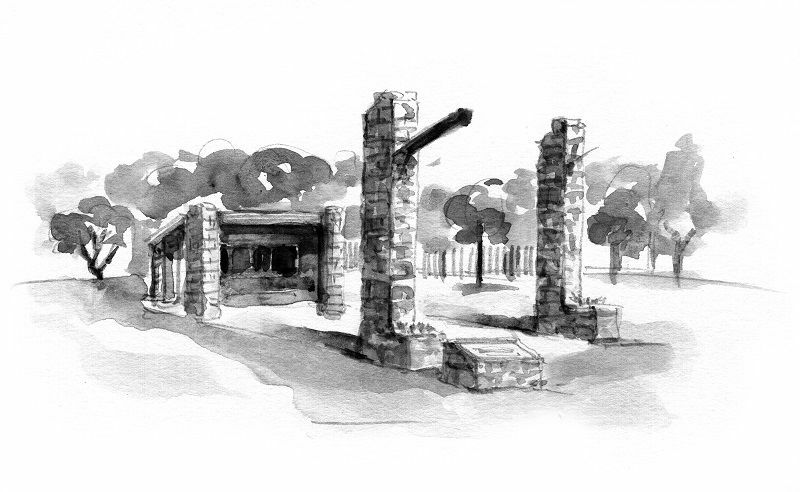 The graveyard at Pilgrim's Rest is noted for the fact that every grave faces the same way except for one, the Robber's Grave, resting place of a miner shot for stealing someone's tent. No one is entirely sure who should take credit for finding the main reef. In 1884 a prospector called Jan Gerritse Bantjes became the first person known to crush gold-bearing rock on the Witwatersrand when he borrowed an ore stamp machine from his neighbouring prospectors and farmers Fred and Harry Struben to exploit a large reef called the Bird Reef that he had discovered on a farm called Vogelstruisfontein. Harry Struben would go on to sit on the first Digger's Committee and become the first president of the South African Chamber of Mines. But the man traditionally given credit for finding the world's biggest gold field and sparking the world's biggest ever gold rush is an Australian prospector called George Harrison who, in 1886, so the story goes, stumbled across what turned out to be the main gold-bearing reef in an outcrop of rock on a farm called Langlaate about 3 miles west of what is now the the centre of Johannesburg. He declared his claim with the government of the South African Republic in Pretoria writing, 'My name is George Harrison and I come from the newly discovered goldfields Kliprivier especially from a farm owned by a certain Gert Oosthuizen. I have long experience as an Australian gold digger and I think it a payable goldfield.' President Kruger took note and pronounced the Rand (Witwatersrand) open for public digging. Harrison for some reason sold his claim for a pittance and moved on never to be heard of again but his name is remembered in the city that his discovery brought into existence with a street, Harrison Street, and a park, George Harrison Park, where there is a monument marking the site of Harrison's original claim. Mining for gold on the Witwatersrand in the early days was rough work. First you had to find the gold. This was achieved by trial and error. The rock had to be blasted into manageable sized pieces with dynamite. Then the ore had to be extracted and taken to the mill where it was fed into a crusher and ground into a fine powder, which was either run through a sluice to separate the elements or run across a chemical such as mercury. Duff Charleywood uses mercury. 'The mercury picks up the tiny particles of gold,' he explained to Sean, 'and lets the grains of rock wash across the table and fall off into the dump. This whole process becomes more difficult and more expensive as you dig deeper. 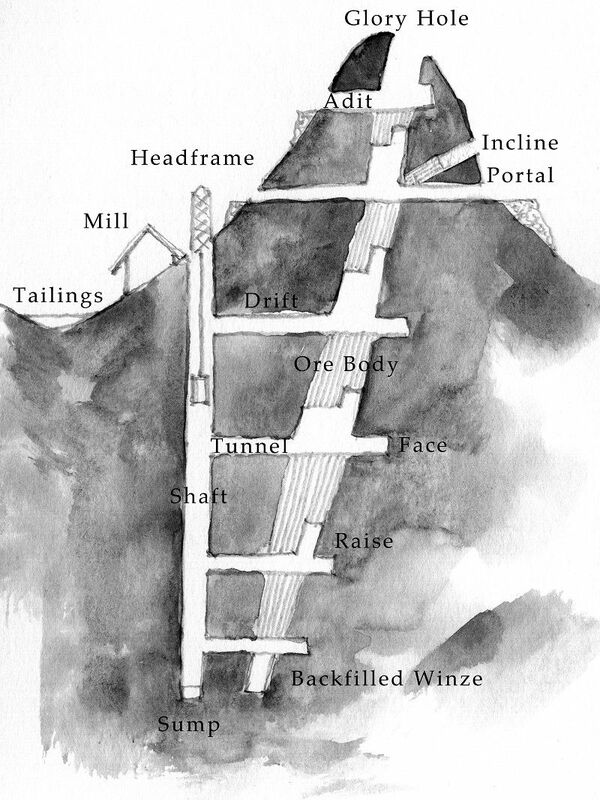 Shafts need to be dug to reach the ore, railway tracks laid and lifts installed to bring the ore to the surface. The deeper the mine the more gold needs to be extracted to make it profitable and so bigger crusher machines are required. The mill crouched black and ugly on the smooth curve of the ridge, defiant as a quixotic monster. Its jaws thumped sullenly as it chewed the rock, it snorted steam and screeched metallically. 'I didn't realise it was so big,' said Sean. The geology of the Witwatersrand means that the gold seams run deep underground requiring the construction of very deep mine shafts–in fact the Witwatersrand today possesses eight of the ten deepest mines in the world. In the 1930s the Robinson Deep reached 8,380 feet, the greatest depth to which man had ever descended at the time, and became the first mine to operate air conditioning for the miners. In 2008 the East Rand Mine east of Johannesburg, which opened in 1893, reached a depth of over two and a quarter miles. AngloGold Ashanti's Mponeng gold mine south west of Johannesburg has reached a depth of over 13,000 feet, nearly two and a half miles. Mines of this depth required large, expensive machinery well beyond the means of many of the early prospectors. The only way forward was for the individual prospectors to consolidate into what became the huge mining corporations of today, such as the Anglo-Australian BHP Billiton, the world's largest mining company, AngloGold Ashanti, the world's third largest gold producer and Gold Fields Ltd. In order to compete, Sean and Duff create and develop a large company they call Central Rand Consolidated.